Located at the foot of Sierra Blanca, Marbella is in the heart of the Costa del Sol, one of the elite's favorites. 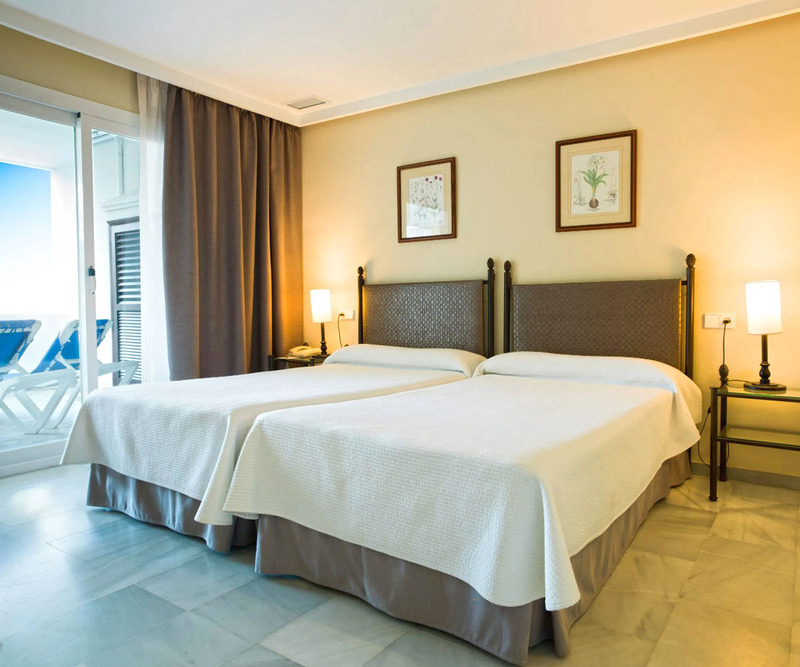 The cozy Sultan Club Marbella Hotel is located in the best area of the so-called Golden Mile, just 150 meters from the beach, 5 minutes from the center of this beautiful city, 6 km from the famous Puerto Banus and 15 minutes from several golf. The hotel arranged with several golf courses special rates for customers. Around the hotel we find shopping malls (El Corte Ingles), shops, bars, restaurants, discos, flamenco show bars, cinemas, casinos, banks, doctors, pharmacies, taxis, bus stops, etc. The Sultan Club Marbella Hotel 4 stars belongs to the hotel chain Monarque Hotels and has 76 apartments spread over six floors. Since its inauguration in 1996, the apartments has been designed thinking of the comfort and convenience of the customer. Views to the mountains, the street or the Mediterranean Sea. The apartments have spacious terraces with sun beds where you can sunbathe or enjoy the excellent views of the best areas of Marbella. If the intention of the host is to know the surroundings of the Sultan Club Marbella Hotel, this should know there is a vast range of sports, cultural and commercial activities. In addition to the fabulous beaches, a must for lovers of sun and tranquility, you can practice water sports like surfing, sailing, scuba diving, water skiing, and anything that may involve an interaction between nature, sports, and the Mediterranea Sea. If you want to know Marbella and its surroundings with a professional guide, you can choose from a variety of package tours in Marbella, Costa del Sol, Andalusia and the rest of Spain. 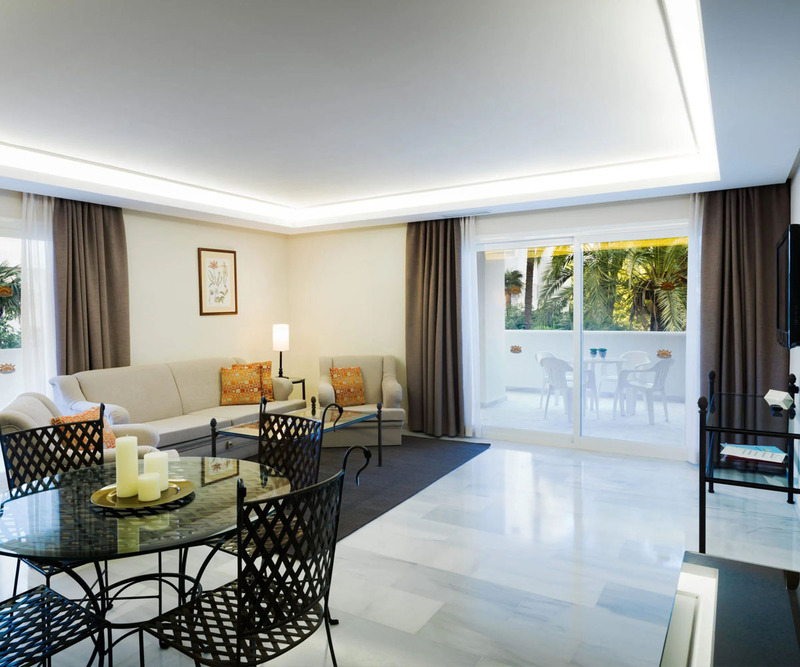 The Sultan Club Marbella Hotel has 76 spacious apartments with 1 and 2 bedrooms apartment spread over 6 floors, with daily cleaning. All have their own kitchen but, if required, you may choose to have your buffet-breakfast at the hotel’s restaurant (extra charge). The One-bedroom apartments are composed of: 1 bedroom with twin beds (double bed on request, no guarantee), an en-suite bathroom, a living room with sofa-bed and rollaway bed, a fully equipped kitchen with an aperture to the living room, a large terrace with sun beds, a table and chairs. Apartment size: approx. 60 sqm. The Two-bedroom apartments are composed, of: one bedroom with a double bed, one bedroom with twin beds, each one with its en-suite full bathroom, a spacious living-room with sofa-bed and rollaway bed, a separated full-equipped kitchen, a large terrace with sun beds, a table and chairs. Apartment size: 80 to 90 sqm.